A year ago, we lost my father-in-law. John was an avid St. Louis Cardinals fan. My Christmas theme this year was in memory of him and my dad. We lost him in 2010. The year before that we lost my mother-in-law. There are decorations on the tree in memory of all three of them. 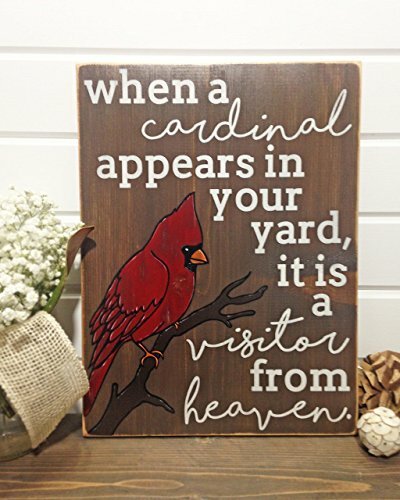 I chose to decorate with angels and Cardinals for them. My frugalfish tip is to remember that this Christmas is not a joyful time for some of your friends and family. Be considerate. Everyone grieves differently. Some like to just be left alone and others surrounded by family. There is no wrong way to grieve. Even though there is an empty chair at the table, they are still with us. We see them in their descendants and the warm memories we share. They are gone, but not forgotten. Sleep in heavenly peace, John. At the front door, a cardinal is sitting in a nest on my wreath. An angel presides over the bird and there are musical ornaments on the sides. I made it by wrapping garland around my grapevine wreath and then wrapped red bead garland and lace around it. The poinsettias on the top are two napkin holders! Under the angel is a red ribbon with a bell tied to it that jingles merrily when the door opens. As you hang your coat on the hook in the entryway, you will see two lamps. One is a Tiffany lamp with a tea light and the other is a Victorian lamp. You will notice Cardinals on this Victorian lamp. I have now given you three clues. It was this quilted throw that confirmed my theme for this year. I found the singing Cardinals at Goodwill. I used them in place of the glass block. There is a glass angel next to them. I wired a wreath to the bottom of the swag light and decorated it with cobalt blue beads and ornaments. I tied burgundy bows to the beads at the points of the window valance and to the top of the light. The centerpiece is a wreath on top of a plate. Inside is a gold angel and on the other side of the decorations are more cardinals. As you walk down the hall, you will see the “JOY” candlesticks that I painted. Three years, well worth it! In the bathroom are more cardinals and another angel. (Shout out to Laura who made the angel in Girl Scouts!) I picked up the white decorated towels on clearance last year and the red towels at a Black Friday sale. The decorated French horn is a brooch. The dining room is lit with my Christmas village and a lighted garland. I wrapped red beads around the garland and used it to hide the cords from the lights. The lights brighten the cake stand and punch bowl on the buffet. There are several baskets and other decorations mixed in on the bookshelf. I put three angels in the center of the table facing out. That way an angel is facing every direction. There are cardinals sitting around their feet. My frugalfish tip for this week is to pick a theme for next year now. You can pick up Christmas decor on clearance after Christmas and you can shop at consignment shops and garage sales for the items you want all year. I am so convinced that no one will guess the theme this year, that I am going to wait 2 weeks to reveal it! Next week, I will show you a priceless Christmas gift to make for grandparents, aunts, and uncles. When you walk to my front door, you will see my Thanksgiving wreath. I made it by wrapping a gilded leaf garland my sister gave me around a grapevine wreath. All I needed to add was a plaid bow! Before you knock, you will see a Pilgrim Bear greeting you from the windowsill. He’ll leave the lights on for ya! On the couch is my new pillow cover that says, “Amazing Grace, How Sweet the Sound.” The braided burlap trim says, “Autumn” to me! I love how the black and white lettering plays off of my black and white music quilt. There are various vegetables around the base of the turkey napkin holder. I decided to use vegetables in my decor. I put a pumpkin basket and a glass pumpkin in my china cabinet. Using the colors from the table runner, I layered towels in the bathroom. I kept the autumn print I got from a link at theinspiredroom.net on the wall and pinned a turkey pin on one towel. On top I put a turkey I made with washcloths. Last week the clocks turned back one hour. In the spirit of changing times, I am going to “fall back” 7 hours next week! I will publish my post at 5:00 p.m. CST instead of 10:00 a.m. Come back to see my Thanksgiving Table! My husband and I ran away for the weekend to celebrate our anniversary. We chose Mason City and Clear Lake, Iowa as our destination. The former “Country Mission Camp” I attended as a teen was near it, outside of Swaledale, Iowa. They took the campers to swim in Clear Lake one year. The “Surf Ballroom,” where Buddy Holly, Richie Valens, and “The Big Bopper” held their last concert is in Clear Lake, Iowa. In Mason City, the puppets from the film, “Sound of Music” are in the Charles H. MacNider Museum. The Historic Walking Tour that goes by 71 historical buildings of significant architectural styles. The Prairie School Architectural Tour where you can view several homes designed by students of Frank Lloyd Wright. A completely restored house, “Stockman House,” designed by Frank Lloyd Wright. We started our trip down memory lane by taking the highway David went on when traveling to Camp Dodge while he was in the Iowa National Guard. We noticed Highway #117, which merged with Highway #65 were a straight drive to Mason City. (Love our paper map of Iowa!) We turned on to it. Later we learned we were traveling the historic “Jefferson Highway” that went from Canada to Mexico! We were getting hungry when I saw a sign that said, “Lincoln Highway.” I remembered reading about a café on the Lincoln Highway in “Our Iowa Magazine.” We turned on it and ate lunch at “Niland’s Cafe,” in Colo, Iowa. Everything is homemade! The raspberry pie tasted just like my Grandma Marie’s pie. The Formica tables made me feel like I was sitting at Grandma’s again. After lunch, we drove through, what I called, “Iowa’s Petrified Forest.” There are miles and miles of wind farms and at least a thousand wind energy turbines. “Country Mission Camp,” where I attended as a teenager, is now a private residence. I could see from the road the brick dining hall and one corner of the white church. It is completely overgrown by trees. There was a guided walking tour for $10.00 each that had not started, but we decided to buy the book for $5.00 and go at our own pace. After walking a block, it started to sprinkle and we finished the tour from the comfort of our van. When we reached the footbridge featured in the “Music Man,” we jumped out and took a selfie. The clouds parted and the sun shone long enough for three poses. There are 40 “River City Sculptures on Parade” on the walking tour. This one was my favorite! We finished our architectural tour at 9:54 a.m. and parked at the “Architectural Interpretive Center” which is right next door to the Frank Lloyd Wright designed “Stockman House.” We took the 10 a.m. tour and learned some history about Mason City before viewing the house. We were not allowed to take pictures of the “Stockman House” but when you go, I challenge you to find the ribbon windows that are not windows, what the wing wall is hiding, the “fumed” wood, the closet with a view, and the working phone! We saw a few ideas we plan to use in our home. The $20.00 was money well spent. We drove to the “Park Inn Hotel” for their tour, see restoration here. Frank Lloyd Wright designed it as a hotel on one end and a bank on the other end with lawyer’s offices between them. This tour was also $10.00 each but we resolved an issue with which we have wrestled for years about a dream addition to our home and that made it a good investment. They allowed pictures for personal use only. When you take this tour, you will hear “The Spirit of Frank,” experience compression and release, learn of clutter-free conference rooms, and see glimpses of gold in the bank. I promise you will not fall, even though some second story walls are barely 30″ high and open to the lobby and dining hall below! Everything is meticulously restored or a reproduction: windows, light fixtures, carpets, walls, doors, built-in cabinets, urns, furniture, and even the bronze statues of Mercury in the bank. By the time we reached, “The Music Man Square,” David didn’t want to go on another tour. I asked the attendant if we could buy some ice cream in the Soda Shop. The “Bear Claw” ice cream was delicious, and with permission, we took a picture there. We had eaten an extra-large breakfast at the hotel and I figured the ice cream would suffice for lunch because we planned on eating an early dinner. I was wrong. This was my view at 2:42 p.m. I learned my man needs his 3 square meals a day! He got a headache from skipping lunch! We made up for it by being one of the first ones seated at the best restaurant in Iowa. The “Northwestern Steak House,” surrounded by 7 ball fields, is on the north side of Mason City. Its reputation is well deserved. Next week, I will share our adventures in Clear Lake, Iowa! Get off of the interstate! Retrace your steps to a place from your youth. You can learn a lot from history. Only take 1 or 2 historic tours a day. Set your own pace and take a nap, if needed! Last year, I shared my version of a patriotic, bandanna wreath. This year I used the same bandanna pieces on my new grapevine wreath. When I made the first wreath, I cut the blue bandanna in half but didn’t cut both halves again. I used the uncut half to make a ribbon. I just folded it into a bow and tied it with a matching thin ribbon. I made the centerpiece for my table with items from at the Dollar Store. The star-shaped, flameless, votive candles fit nicely in the star-shaped dishes. I found three of them at Goodwill a few months ago. I put a fourth star-shaped dish in the china cabinet behind a resin cardinal that I picked up at Dollar General. I found another cobalt vase at Goodwill and used it to provide symmetry on my vignette. Last week I showed you my Easter decorations with purple as the accent color. This week I want to show you what you would see if you came to my home for Easter dinner. On the front door, my Easter wreath has blue eggs which remind me of robin’s eggs and a purple bow that I made myself. Walking down the freshly painted stairs you will see my children’s Easter baskets that were gifts from their Aunt Michele. There are also stuffed rabbits for my children to color but they were never finished. Perhaps this Easter? On either side of them are wooden rabbits with colored eggs in their backpacks. In my basement dining room, the table is ready for dinner. Gold is popular this year and I used my gold chargers with my white and blue plates. Everything seems to match perfectly until you look closer. My purple candles do not match. I used the sparkly lilac candle for the centerpiece. The largest rabbit holding a pink egg was hand painted by my sister. (Ceramics were big when we were teenagers.) She put it in a box to give away before she moved out of the family home. I rescued it because I love holiday items! The tapestry of “The Last Supper” stays on the wall all year. I did not have enough gold napkin rings and alternated them with silk floral ones. I put two purple ones on the candles in the center of the table and used the blue and yellow ones on napkins. The yellow floral napkin rings bring out the yellow in the centerpiece. My secret this week is to use items based on color, not the holiday. My Easter table has a Christmas tablecloth! You have to look really closely to see the holly and ivy on it. (Although, my daughter-in-law noticed it the first time I used it. She has an eye for detail!) I don’t have room to store two white, two red, and two green tablecloths. I use all three of them throughout the year, even though they have a holly and ivy pattern.